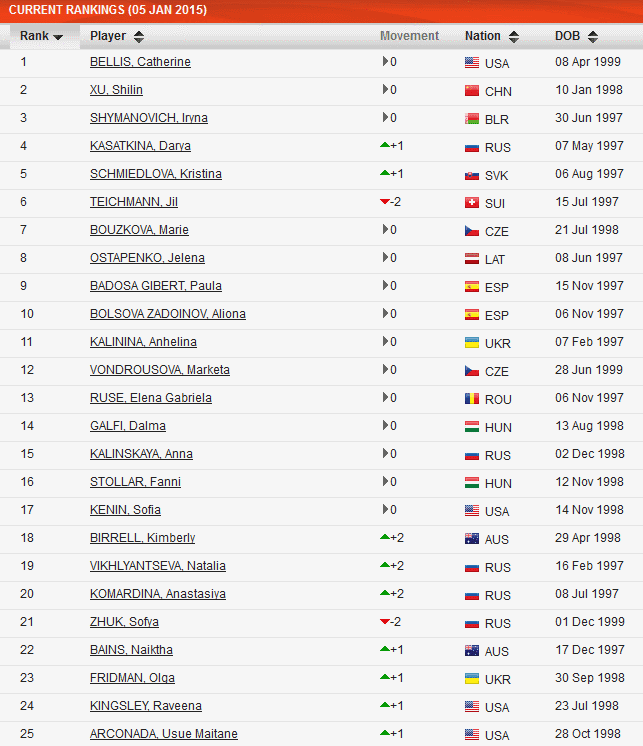 The International Tennis Federation (ITF) has released the first edition of its' 2015 World Junior Rankings this week. After the removal of the no longer eligible 1996 born players, the United States is left with fourteen boys and fourteen girls in the Top 100, the most of any nation. Russia has the next highest total, with twenty-one players, followed by Australia with fourteen. Stefan Kozlov and Catherine Cartan Bellis lead the USA's contingent. Joining the 3rd ranked Kozlov, who was as highest as No.2, in the Top 10 Boys club are Taylor Harry Fritz (5) and Michael Mmoh (8). 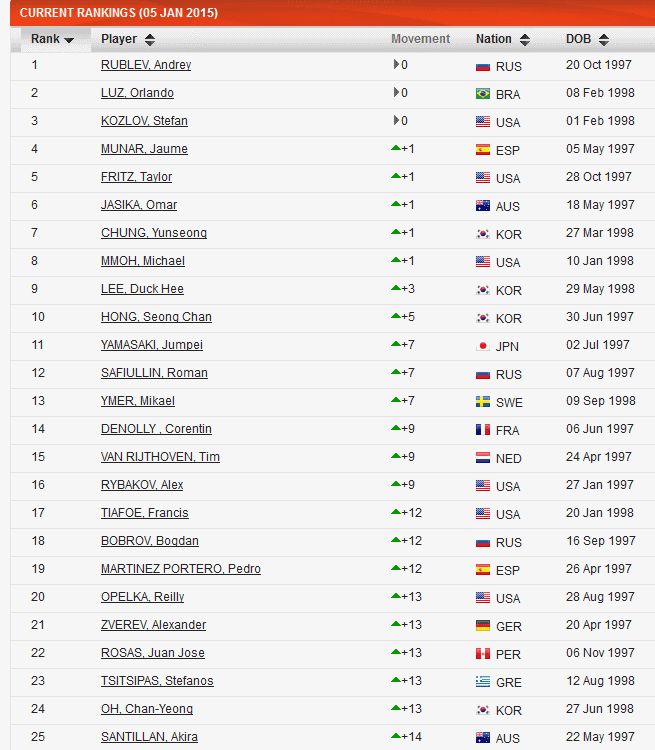 Former World Junior No.2, Francis Tiafoe, Alex Rybakov, and Reilly Opelka round up the Top 25. 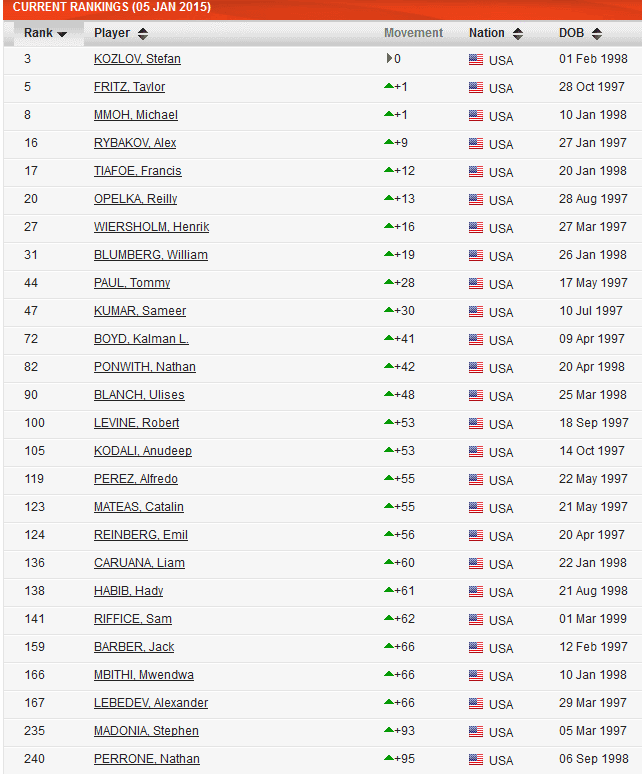 Other players inside the Top 50 include Henrik Wiersholm, William Blumberg, Tommy Paul, and Sameer Kumar. Fifteen year old Catherine Bellis, also known as CiCi, tops the Girls World Junior Ranking and is the sole American inside the Top 10. The next highest USA representative is Sofia Kenin at No.17 followed by Raveena Kingsley (24), Usue Maitane Arconada (25), Ingrid Neel (43), Michaela Gordon (46), and Caroline Dolehide (50). 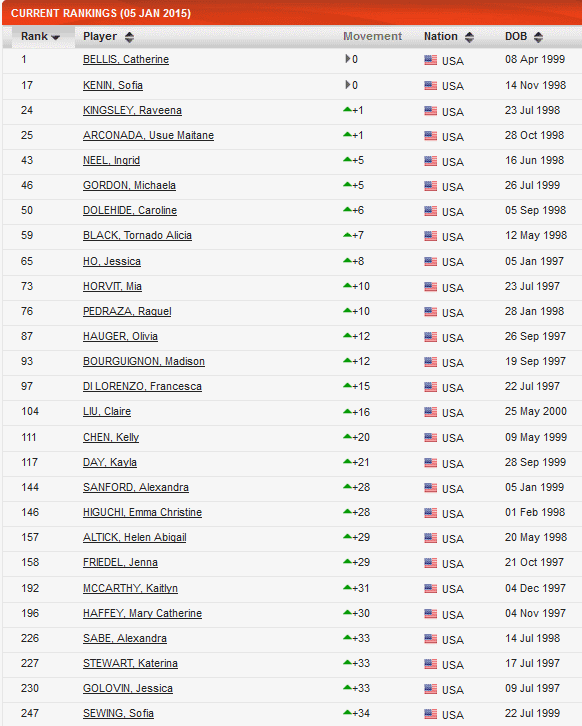 Tornado Alicia Black, formerly ranked 3rd, falls to No.59 after a limited Junior Circuit schedule last year. See the lists below for other players. For more rankings, visit the International Tennis Federation Rankings Page.